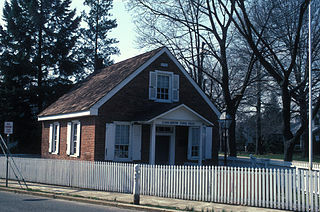 From the days of its colonial settlement through its first decades as a state, education in New Jersey was primarily the responsibility of parents, churches or other private patrons. Parents would either teach their children at home themselves or, for those who could afford the costs, hire tutors. In some cases, groups of parents would join together to pay salaries of teachers who would hold classes in larger homes or buildings newly constructed as schools. Some paupers, orphans and indentured children received free schooling from churches or wealthy private sponsors. Girls generally did not attend school, but many were taught at home by parents, older siblings or in small groups organized by parents, tutors or others. In 1817, the state government first assumed a role in education when the legislature established a state School Fund financed by sales of state-owned land subject to the flows of the tides. Disbursements from the Fund, however, were not made until 1829, shortly after a commission appointed by the governor recommended a series of actions to improve schools. A law was enacted authorizing distributions from the rather modest state School Fund to counties, based on the amount of taxes received by the state from each county, thus providing that wealthier counties would receive the highest allocations. The freeholders of each county would then in turn apportion school funds to municipalities based on the amount of municipal taxes received by the county, thus reinforcing the distributions based on comparative wealth of the respective towns. In addition, the 1829 law authorized the residents of each township to vote on whether an additional amount was to be raised locally “by tax or otherwise” to supplement the School Fund revenue. Other legislation enacted in 1829 included establishing a state board of education and a state superintendent of public instruction with authority to enforce school law; requiring schools to be free to all children aged 5 to 18; and permitting local districts to appoint school superintendents. But the measures failed to provide a stable source of financing. The legislature often diverted revenues from the school fund to meet other demands and voters at annual town meetings frequently rejected raising supplemental funds, resulting in public schools being forced to close early in the school year or require parents to pay tuition to keep them open. In 1844, a new state Constitution was adopted to replace the state's original 1776 charter. Responding to the legislature's frequent diversion of revenues from the purposes of the School Fund, the new Constitution ensured the permanency of the School Fund and also prohibited the legislature from using its revenues for any purpose other than the support of free schools. Two years later, in 1846, the legislature passed An Act to Establish Public Schools, which, although continuing the distribution formula of the School Fund from the 1829 law favoring wealthier counties, required towns to raise “at least equal to and not more than double the amount” apportioned from the School Fund. In 1851, the allocations from the School Fund by counties to local schools were revised to apportion the distribution based on each school district’s student population as counted in an annual school census, rather than on a town’s property tax ratables. One of the first public schools was founded in Bordentown in 1852, initially with only six students, an enrollment which surged to 600 in its second year. After the Civil War, the state strengthened its oversight of the schools and restricted the freedom of local taxpayers to deny school funding. Towns which rejected measures to raise school revenues were denied shares of the state School Fund, forcing them to charge tuition fees or close their schools. Legislation enacted in 1871--An Act to Make Free the Public Schools of the State-- was the first to provide that public schools would be entirely financed by a state-derived revenue source, the distribution of which was based on the population of each district’s school-aged children, with each locality allowed if it so chose to to raise additional revenues. The law abolished tuition fees, required that schools be open for at least a nine-month school year, and mandated that all public schools “shall be free to all persons over five and under eighteen years of age”32 and imposed a “State school tax of two mills on each dollar of the valuation” of real and personal property. The Legislature shall provide for the maintenance and support of a thorough and efficient system of free public schools for the instruction of all children in the state between the ages of five and eighteen years. In the twentieth century, public schools became free for every student between ages 5 and 20, and education was made compulsory for all students between the ages of 6 and 16. As it struggled to cope with the expanding enrollment caused by the post World War II "baby boom" generation, New Jersey's school system remained largely centered on local control and financing through the tax on real property. The ability of local districts with stagnant or declining property bases to maintain school support became increasingly strained with demographic and economic changes as older cities lost population and taxable property to rapidly developing suburban communities. In 1967, riots in Newark and other cities illustrated the sharp divisions of income, property and race between wealthy and poor municipalities in the state. 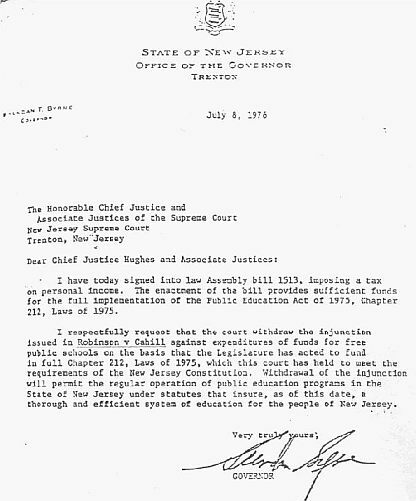 In 1972, New Jersey’s system of financing public education through its excessive reliance on revenues from the local property tax was ruled unconstitutional by the state Supreme Court in Robinson v. Cahill, a lawsuit brought by a Jersey City high school student and his parents against Governor William T. Cahill. The court's opinion justifying its decision primarily relied on the 1947 state constitution's provision, inherited from the language of the 1875 constitutional amendment, that the state government had an affirmative responsibility to provide a "thorough and efficient" education for all students. Despite Governor Cahill's support of the goal of the decision, he failed in his efforts to have the legislature approve a state income tax and a sales tax increase to generate new revenues for additional state aid to local schools. After he took office in January 1974, Governor Brendan T. Byrne also advocated approval of an income tax to raise funds to comply with the Robinson v. Cahill decision, but suffered a steep drop in his popularity as his proposals were rejected by the legislature. It was only after the state Supreme Court issued an extraordinary order closing the public schools effective July 1, 1976, that the legislature mustered the majorities a week after the schools had closed to pass the income tax. In the following years, controversies would continue over the state government role in public education, particularly the extent of its oversight of school performance in requiring reports from administrators and teachers and expanding mandatory student testing. In the administration of Governor Thomas H. Kean (a former private school teacher himself), the state also enacted laws in the 1980s mandating minimum teacher salaries; establishing a program for licensing of teachers who had not followed traditional paths of teacher education and training; and introduced a system of monitoring school performance, with districts failing to meet federal or state standards required to adopt and implement a plan to correct deficiencies. The state Supreme Court also continued its role in education through a series of decisions in the Abbott v. Burke litigation, the successor to the Robinson case in challenging the adequacy and effectiveness of state support of education. In 1997, the Court decided that the Legislature's newly adopted "standards-based" approach to education substantively defined "a constitutional thorough and efficient education" by establishing state curriculum standards in language arts, mathematics and five other content areas. Another Abbott decision held that the state also had a responsibility to guarantee quality school buildings in poor districts, leading to the legislature's approval of an $8.6 billion statewide school building construction and renovation program, the Educational Facilities Construction and Financing Act of 2000. Public and political support also brought legislation authorizing creation in 1997 of charter schools operated by a private, non-profit board of trustees, but with their establishment and continued operation subject to licensing by the state. The state has also implemented a program of inter-district public school choice to allow students to transfer to a school district other than their district of residence. In 2010, the state Board of Education replaced the state-developed standards in language arts and math with the nationally developed Common Core, which had become controversial in several states where critics had contended it excessively interfered with state and local control of education. In 2012, the Board of Education approved replacement of the state's tests with national Partnership for Assessment of College and Career Readiness (PARCC) tests to measure student achievement of the Common Core. The new PARCC tests were administered for the first time in spring 2015. Shortly after, Governor Chris Christie announced he was reversing his prior support for the national Common Core program and called for new, as yet undeveloped, New Jersey-based standards while also continuing use of the PARCC tests. A task force subsequently appointed by the Governor later recommended in January 2016 keeping most of the Common Core standards.